* Dimensions: 24''W x 18''D x 24''-42''H. * Colors available: Black, Red, Royal Blue, Green, or Yellow. The C AVJ42 is an adjustable height / open shelf computer table with 4'' casters and electric assembly. It is also available with an optional sliding keyboard shelf (C AVJ42KB) or as a cabinet (C AVJ42C). The height is adjustable in 2" increments, ranging from 24" to 42", the latter ideal as a standing computer desk. The AVJ42 computer cart includes electric assembly. * Many Options! 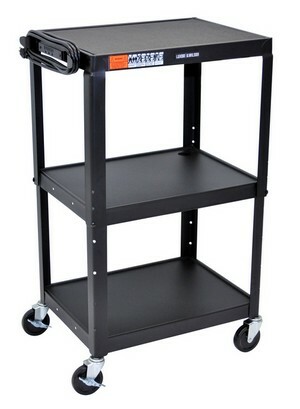 This line is also available with the following options: a) large 8" Wheels on one end plus UL Listed safety strap (C AVJ42B); b) Cabinet (C AVJ42C, as explained and pictured above); c) with keyboard shelf (AVJ42KB); d) Lower heights: 34 or 26"; expandable width w/foldable side shelves (C AVJ42KBDL), etc..